Children make lists of what they want to get. Santa makes a list of the people he’s going to give to. The rest of us make lists of how much we’re going to spend on people. The holiday shopping season is upon us, which means there’s no better time than now to create your shopping budget. Stick to the following tips and you won’t need any holiday magic to manage your seasonal gift-buying budget – just a little planning and preparation. Before you swipe a single credit card or write a single check this holiday season, you’ll need to take a good, hard look at your finances. The first step in creating a budget is setting a specific dollar amount that you can devote toward your shopping. What are you willing to spend on Christmas gifts this year? What can you realistically afford to spend? Calculate an amount that both you and your checkbook are comfortable with. The average person celebrating Christmas, Kwanzaa and/or Hanukkah will spend $804.42 this year, according to the National Retail Federation’s Holiday Consumer Spending Survey, but the amount you’ll spend is up to you. Once you set an amount, write it down on a piece of paper or type it into your smartphone so you can easily refer to it. Having an actual figure you can look at – as opposed to an idea in your head – will not only help you remember the number you settled on, but will also provide you with a place to keep a clear accounting of your purchases as you start shopping. Approach your total budget as a fixed number, rather than something that can be negotiated or altered, so you can hold yourself accountable for your own spending. 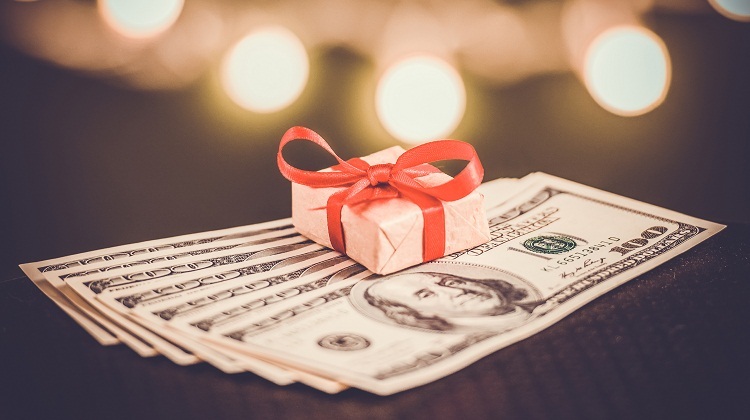 A holiday gift budget sounds like a great idea, but your maximum spending amount is really just a number until you put it in terms you can understand. To do this, write a list of every single person you want to give a gift to this holiday season. Now take a look at that amount you set and do the math. This will help you determine how much you’ll be allowing yourself to spend on each specific person. If your budget doesn’t permit you to spend as much per person as you’d hoped for, try making some changes. You can cut costs by consolidating your list. Instead of buying one gift for your sister and another for your brother-in-law, consider purchasing one gift for the couple. Instead of buying something for each one of your co-workers, buy a universal gift that everyone in the office can benefit from. While you may want to buy extravagant gifts for everyone on your list, it simply may not be feasible. Be realistic about your budget and your financial limitations. Don’t outspend your means and don’t go into debt to purchase lavish gifts. After all, as the saying goes, it’s truly the thought that counts. Thus, this holiday shopping season, don’t be opposed to affordable gift ideas. A gift doesn’t have to be expensive to be well-received. Consider making an arts-and-crafts project or baking a festive dessert. You can’t put a price tag on your time and effort. A budget is essentially useless unless you actually stick to it. Once you actually have a firm budget in place and you begin shopping, hold yourself to your original plan. Keep track of how much you’ve spent along the way to avoid overbuying as the season progresses. If you find yourself in a pinch, you can stretch the value of your holiday budget dollar by targeting store sales, comparing prices between retailers, clipping coupons, applying discount codes to online orders and taking advantage of free shipping offers. Finally, remember that you should aim to spend at or below your budget amount – not above. If you view your budget as too flexible, you may end up far exceeding what you originally set out to spend.